As the duck and regular goose season begins to wind down, we wanted to share a little bit of what Fowled Reality has captured so far in this short goose and duck hunting video sizzle reel. Everyone had high hopes going into this season with record numbers of birds surveyed across the north just as last year. We learned last year that no matter how many birds there are, without cooperative weather, the season would be tough. One would think we couldn’t experience back-to-back warm winters. Well, we have. We’ve had our share of cold fronts this year, but the 20 degree drop in temperatures has quickly been followed by unseasonably warm temperatures. Many of the waterfowl migrations we’ve experienced across the Central and Mississippi Flyways have been short lived. New birds would arrive, rest up, and either lounge in the warm temps or continue south. It has been a battle to find ducks and geese to hunt. More miles have been driven than ever before, but we’ve captured some great hunts all across the country. In this goose and duck hunting video, take a look at some of the best so far from the Central, Mississippi, and Atlantic flyways. Be sure to check out our first teaser video for the upcoming season. It was filmed in North Dakota with the guys from Muddy Dog Outdoors. We had an outstanding week of hunting in the Prairie Pothole Regions killing mallards in corn fields. Conditions went from cold and snowy to unseasonably warm and then back to snow. The birds were constantly changing their patterns and we had to stay ahead of them in order to be successful. 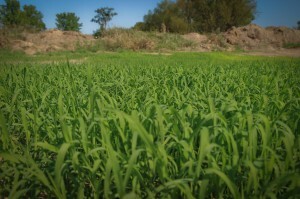 Food plots for ducks are vital to ducks health during the migration. The weather and available food from what you plant play a huge role in the success or failure of your season. 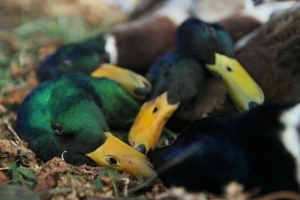 Waterfowl management is something we are new to here at Fowled Reality. Being predominantly freelance hunters doesn’t lend many opportunities to manipulate the land in a way beneficial for ducks. Farmers are often reluctant to let you hunt on their ground, let alone build a levee or disk up a portion of their field for moist soil habitat. This year, we have been lucky enough to have been given the opportunity to do so. The landowner has allowed us to clear out an un-farmed portion of a waterway. We’ve planted Golden Millet in it from 5 Oaks Wildlife Services and the rains have came. The Golden Millet is now headed out and in just a few shorts weeks it will be dropping seeds into our water hole. By that time, all we will need is cold weather to send the birds south and the hard work will hopefully pay off. All of this “hard work” planting food plots for ducks has taken days. They say nothing in life worthwhile is ever easy. This new duck hole definitely hasn’t been easy. From a record setting drought to 14 inches of rain in a couple months, our ability to adapt, manage, and keep our sanity has been tested. Luckily, we have managed to fight through the trials and tribulations, but we’ve been faced with spur of the moment hour drives to the Golden Millet hole, networking to obtain a generator/pump to avoid spending hundreds of dollars, and time away from our families. The time away has been the hardest pill to swallow because all of this work has taken place during the off-season. This is a time when we are supposed to be home getting the “honey-do” lists complete. The waterfowl season is a 4 month pedal to the floor grind that we travel 1000’s of miles of every weekend to fill our desire of chasing ducks and geese. It is a struggle to keep the balance between our love for waterfowl hunting and our obligations as husbands, boyfriends, and fathers. So how do we do it? We are lucky to be a part of The Management Advantage and have been featured on how we as husbands, boyfriends, and fathers balance our families, duck hunting, and planting food plots for ducks. Check out the video and let us know what you think. It’s a fine line between keeping momma happy, raising your children, and still killing ducks, but it’s something most duck hunters manage! Waterfowl hunting videos are only viewable on your phone when you have the signal to do so. While cell coverage has improved greatly over the past couple years, many of the places we hunt still lack reliable coverage. Often times finding ducks or geese to hunt requires traveling the back roads. With anticipation high for the next days hunt, what better way to get prepared than to watch some waterfowl hunting on videos. Now, you can watch those videos no matter if you have service or not. On June 1, Full Exposure Outdoors will be releasing the FEO TV app on the Apple and Android markets. 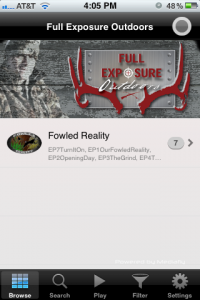 For $9.99 you can download the app to your phone which will give you the ability to download episodes of Fowled Reality and other hunting shows. So rather you are a duck, deer, or turkey hunter, FEO TV has what you need. 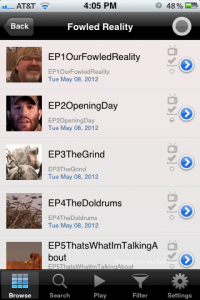 What sets the Full Exposure Outdoors TV app apart is it's ability to allow you to download episodes.. This allows users to watch waterfowl hunting videos and other hunting videos whenever they want no matter if they have internet coverage on their phones or not. The perfect app for the remote duck lodge of tree stand located miles from nowhere! Fowled Reality is excited to be involved with the innovation behind FEO TV. Look for the Full Exposure Outdoors TV app on the Apple and Android markets in just a couple weeks on June 1. To sweeten the deal, if you purchase the app before July 4th, you'll be registered to win a free Northwest Kansas Archery Antelope Hunt for the 2012 season. We’re going to end Fowled Reality season 1 with a waterfowl hunting video featuring some of the best kill shots we captured on film this year. We like showing the story that goes with every waterfowl hunt. Our hunts are more than just driving to a place and killing ducks and geese. It takes lots of work to make things come together to harvest a good number while duck hunting or goose hunting and sometimes, even with all the leg work, things still don’t pan out. After all the work that goes into our waterfowl season, it’s nice to sit back and watch some of what we were able to film. We know there are a lot of you out there that love watching birds dump in and drop….this waterfowl hunting video is for you! Our waterfowl hunting videos wouldn’t have been possible without the help our partners, Muddy Dog Outdoors and KES Waterfowlers. Fowled Reality want’s to thank them for supporting us and working with us to show what goes into a season. To help you in the 2012/2013 season be sure to check them both out! Stay tuned to the website and our Facebook page for off season videos, new waterfowl hunting news, and to find what shows you can catch the KES Waterfowler crew, Muddy Dog Outdoors crew, and the guys from Fowled Reality. http://fowledreality.com/wp-content/uploads/2012/04/Thumbnail14.jpg 669 1000 Fowled Reality http://fowledreality.com/wp-content/uploads/2016/06/FRLogoWhite-300x200.png Fowled Reality2012-04-30 02:33:202012-12-07 02:44:39Waterfowl Hunting Video - Fowled Reality EP9 "Cut'Em Boys"